Lace doilies are beautiful, time-consuming pieces of art. 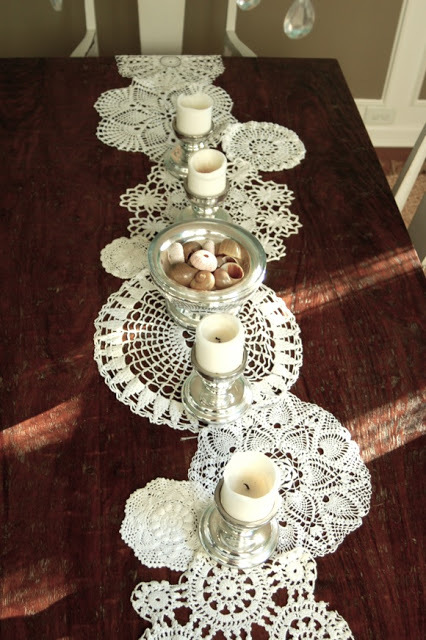 Whether you have heirloom pieces, some you made yourself, or just a few you picked up at a yard sale, here are a few ideas to up-cycle your old doilies and display them in unique and beautiful ways. 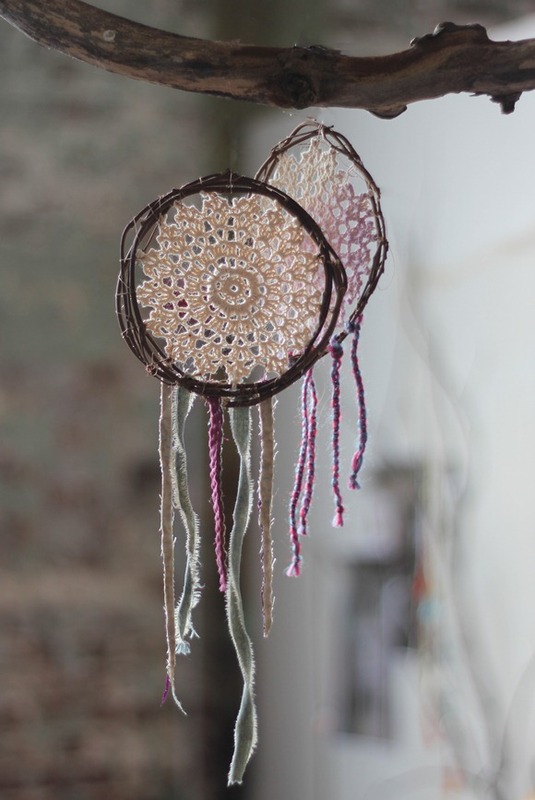 DIY Doily Dream Catcher from Free People. 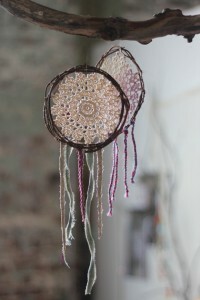 The first idea is this shabby chic idea from Free People. The doily is sewn to a twig wreath, then sew on a few fabric or yarn scraps to the bottom. So easy! 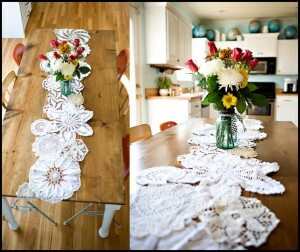 Doily Table Runner by Ashley Ann Photography. 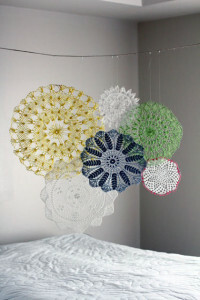 If you have a lot of doilies, this may be the project for you. The spontaneous look of this project keeps it from feeling formal, like a traditional lace table runner might. Doily Table Runner by Michelle Hughes. Here’s another version of the doily table runner. 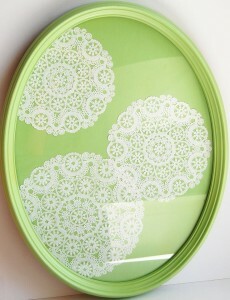 Framed Doilies by Songbyrd Vintage at Etsy. Sometimes the simple ideas are the best. Just frame a few of your favorite doilies – the lime green here adds a modern edge. 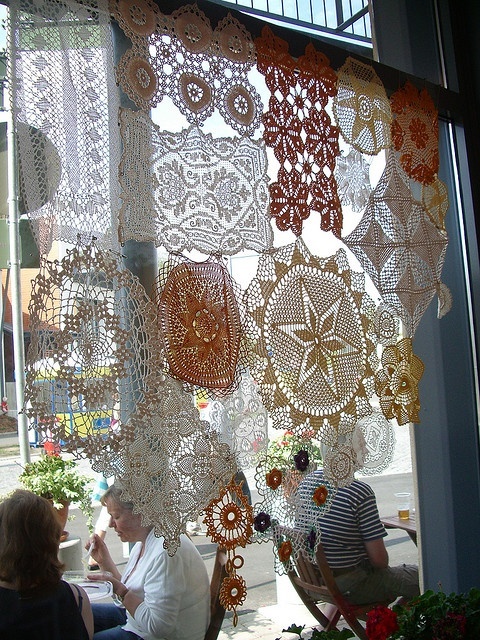 Note: This is a great way to display a particularly priceless doily, but please take care when choosing the backing material! To preserve your doily, use acid-free archival quality paper for the background. 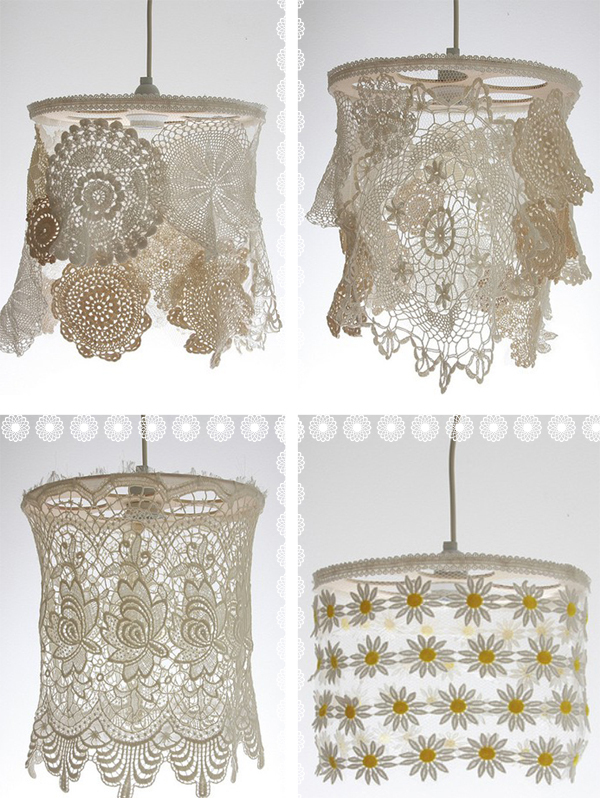 This photo shows there are two different kinds of doily lampshades. 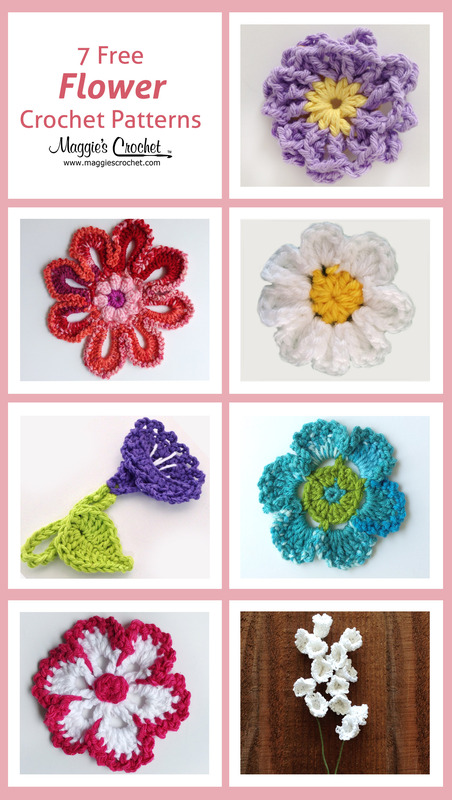 The top two are made with an assortment of doilies, while the bottom two are made with either just one doily or several identical ones. The latter is a little more formal and structured, while the former is more shabby chic and fun. 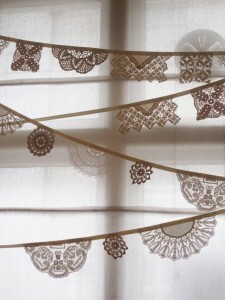 Doily Bunting from Bunting Boutique. These would be beautiful decorations for any party or wedding! 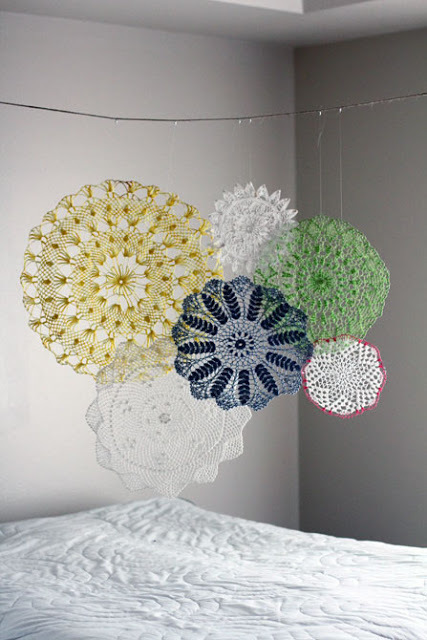 These hanging doilies remind me of sun catchers. They would be a great way to divide a room. 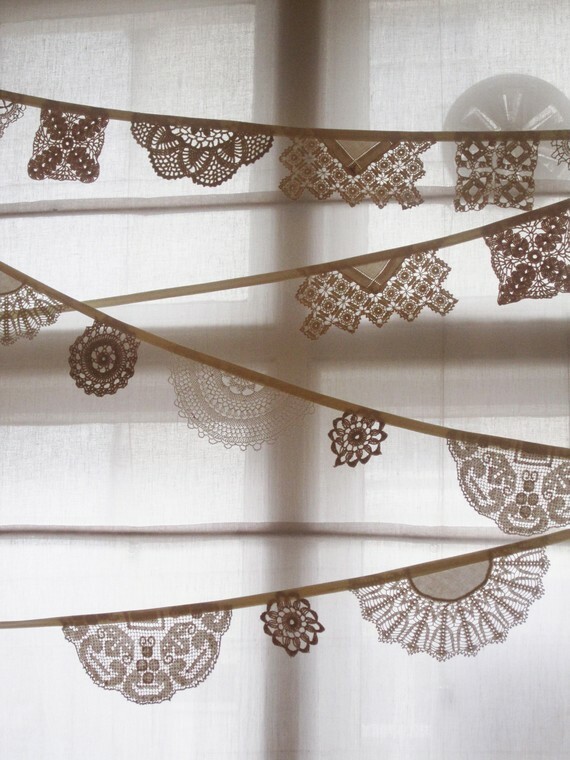 Doily Garland by Swoon Studio. 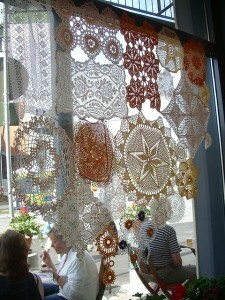 My favorite thing about this doily art is the beautiful colors! The layout is also very appealing. 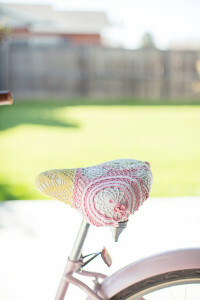 Crocheted Doily Bike Seat Cover by Diana Elizabeth. You can use doilies to cover anything – even a bicycle seat! 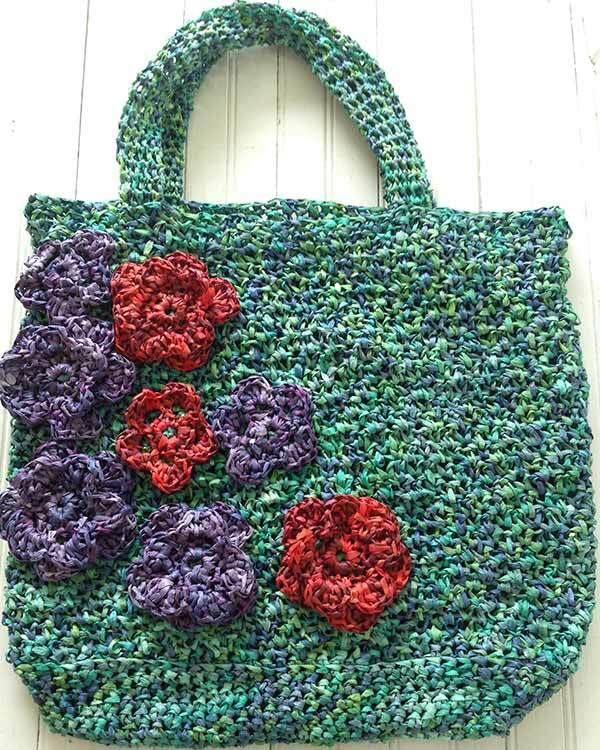 Check out our Recycled Crochet Lace Designs board on Pinterest for more great ideas. DISCLAIMER: All images are copyrighted by their respective owners. Links/Credits are provided via click-through link or caption. Clicking the link of the image will lead you to its source. While effort was made to credit the original source of these photos, it is sometimes difficult to determine where a photo originated. We would be happy to credit you for your image if you will provide the original link. If there is an image appearing on this blog that belongs to you and do not wish for it appear on this site, please E-mail with a link to said image and it will be promptly removed. 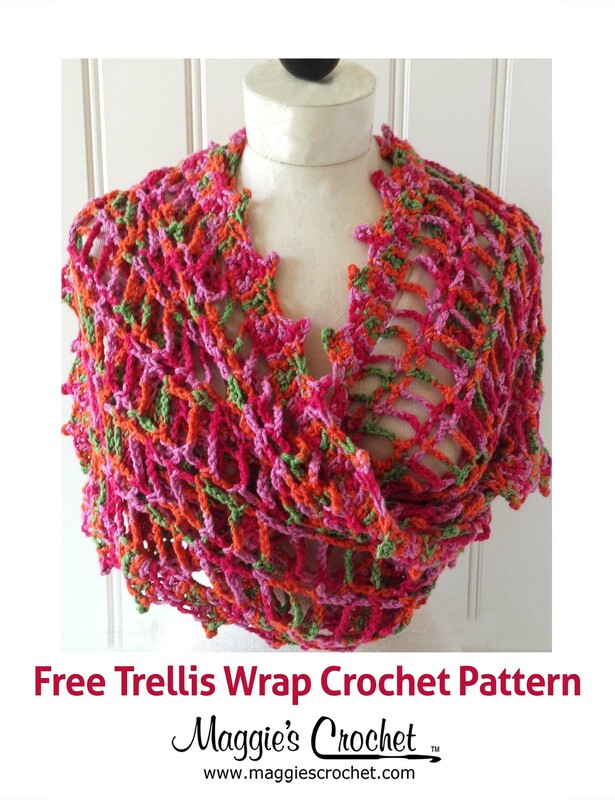 Maggie’s Crochet is not responsible for the content of third party websites.